Henrik born and raised on a farm in the southern part of Sweden and he lives in Stockholm, the capital. He has a house in the country side also, where the smoker resides. It is just a one hour drive from the city, so he's there almost every weekend. He spent his senior year in high school as an exchange student in the US. He has also worked in the US and in England several times writing realtime financial trading applications, specializing in performance. He has since broadened his software engineer practice so he now works with performance in general for various projects. "Basically they call me in when it needs fixing and don't know how." He started with food quite late, didn't grasp the concept at first. "I read recipes like an engineer. If the recipe said 1 teaspoon of salt, I wouldn't deviate. Soon enough I discovered the fun in experimenting and trying out new combos, and I went to town trying to decipher everything, so I could start putting the pieces together from the ground up. I enjoy cooking quite a bit, and have always been intrigued by barbecue. How in the world can you get a piece of meat to taste so heavenly after 12-14 hours in a smoker? I just had to figure that one out. So, I've spent years testing, failing, reading up to become better at grilling. In 2013 I had worked too much, so I took 5 months off to 'de-stress' and just cook. I did barbecue for the entire time, to improve my game. That was nothing short of awesome. I'm basically self-taught in the kitchen, but I have taken one class that I recommend for everyone: butchering, or how to butcher. I learnt so much seeing exactly where each cut is on the animal, and how to cut it." 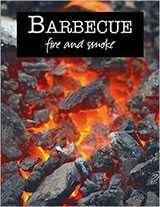 His name is pronounced just like the English name Henry, with a K on the end, and if you speak Swedish, here's his blog Hank's True BBQ and here's a link to his book, Barbecue, Fire and Smoke.